Professional Hair Clippers Vs. Home-Use: What’s the difference? 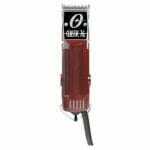 Oster 76 Review: Why Do Barbers Recommend This Hair Clipper? Don’t Buy Andis Bgrc Until You’ve Read This Hair clipper Review! First published July 11, 2014 , last updated April 4, 2019 . Reading time: 18 minutes. If you don’t care about all the options and just want a quick recommendation, here are the three best clippers available in 2019. If you want a more thorough break-down with reviews, then read on! Time-tested classic of the hair clipper world. Powerful, sturdy, and will last you a long time. Great for people who need a one-over every couple of days with a single size. Can be used in the shower, and is adored by the customers. Best for cutting your family’s hair. Features a built-in vacuum cleaner, making the clean-up troubles a thing of the past. These clippers cost roughly the same as a single haircut at the hairdressers’, so they pay for themselves in a single session. Hair clippers are a slow-moving market. New products don’t come out often. Clippers that work well stay on sale for years before they disappear from the market — or shops. As a result, barbers’ recommendations are invaluable. I researched the web, barbers’ forums, and interviewed hairdressers in person. Of course, home use is a lot different from the shops. To get perspective on customer market, I sifted through thousands of Amazon reviews, review websites, grooming forums, and Reddit and Quora threads. Combined with my own experience (and the need to get myself the very best clippers available), this researched helped me put together this list. Judging by the overwhelming vote and Wikipedia, the absolute best hair clipper companies right now are Oster, Andis, and Wahl. It should be no surprise that most of the tools from this list are from these companies. However, as you’ll see, the personal use top pick surprises! I am confident the selection I made will help you with your decision for you. Please comment below if you have any suggestions of your own! Note: Before ordering please check the version of clippers; they differ by voltage and power plug type. First, we’ll look at the professional best hair clipper options. You’ll find these move in the price range of a hundred to a few hundred US dollars. If this is above your budget, don’t fret! We’ll take a look at more frugal options in the next sections. Just looking for something to maintain your buzzcut with? Shortcut Pro won’t disappoint. While you won’t be able to cut any masterpieces with it, it’s extremely effective in what it does — and that is, cutting your own hair. Boasting a great rating on Amazon, these funny-looking clippers offer a 40-minute run time off of a single battery charge. Since it’s very small in size, it’s great for travel, too. With the product, you’ll also receive a handy pouch to store it into. This is, like the Vacuum Haircut Kit I mentioned above, more of a novelty product. It seems like people still like it! Since it’s curved, allowing you to follow the natural shape of your head and get done with cutting your hair in a few swift motions. Click here to check the price of these clippers. Ah, yes. This clippers have “classic” in their name, and let me tell you, they really live up to it! The company has been producing clippers from 1928. This absolute favorite among barbers and others in-the-know are proving time and time again that they are the sturdiest, most reliable, most durable, and simply the best hair clippers of all. Reviewers are similarly excited about the product. The clippers come in different colors, and each features a powerful Oster motor. If you’re worried about these being too heavy for home use, you’re not the only one. The clippers are fairly heavy in weight (2.1 pounds / 0.95 kg), so your arm could get sore after a long time using it. That, however, is not a huge concern of the reviewers who feel that you don’t notice the weight when cutting a single haircut. Still worried? Then get the new model of the 76s called Outlaw. It’s the same product, but with a modern design and lightweight. Click here to find compare the price of Oster 76 to the new Outlaw. These clippers do not have the typical lever that many clippers have, but instead requires you to swap different blade sizes when fading haircuts. This can be annoying for some hair clipper buyers used to simpler ways of adjustment. You can buy separate plastic guards to somewhat alleviate the issue. The set includes two different-sized blades, a 000 and a 1 so you can start with the most basic haircut (the “number one”) right away and even fade it with 000. Therefore, if you’re looking for a powerful trimmers capable of cutting through the thickest hair that will work without problems literally for generations, these Oster clippers will certainly not disappoint you. Click here to see the one thing customers complained about Classic 76. Besides the Oster Classic 76, these are the rest of the favorites in the professional section. Hold that cursor! We’ve got something (almost) better than 76. Model 10 is an improvement of the 76. It’s a bit lighter and smaller, making it easier to use. The original Model 10 came out in 1958 and still has the same sturdy design, but boasts a new motor. As far as performance goes, they are both there somewhere. Same with resistance to drops and general sturdiness. Click here to check if you can get free shipping on Model 10! The set includes one guard and a single 000 blade along with a couple of accessories (lubricating oil and a cleaning brush). Same principle of adjusting the size as with 76 — you’ll need to swap the blades. Fortunately, you can use any Oster blades on any Oster clippers. People are very happy with their investment into these hair clippers. A few said that it gets hotter than 76, but that shouldn’t be a problem if you intend to use them for home use. If you’re on the fence between this model and the 76, look at your hands. No, seriously. The reviews say that the Model 10 fits small hands a lot better. Click here to read why have users rated this clippers with 4.5 stars! Moving on from Oster, but staying with the professional-level clippers. Andis was started around the year 1920 in Wisconsin. Funnily enough, Oster was also established in the same city, just a few years later. Do you think the founders knew each other? Andis was opened by three guys who then split to start a new business each. One of the guys with the name Andis started making the popular hair clippers Master Clipper that are still equally amazing today (read the full history here). The 5-speed is no different. As the name says, you can switch back and forth between 5 different speeds depending on the thickness of hair and the haircut you want to do. Click here to view close-up pictures of the buttons on these hair clippers. The Andis 5-Speed also feature a 360-degree cord swivel which people claim is quite useful. Amazon reviews say that compared to the 76 (which is the industry standard), the 5-Speed feel slightly more comfortable to use and are almost as powerful. As far as weight goes, there isn’t much difference between the two. Dislike fumbling with cords? You have two options. Either get the special battery pack to attach to these clippers (they’re convertible), or get the much more expensive Andis BGR +. Oster seems to build their brand on the retro design of their clippers, while Wahl (haha, try to pronounce that!) is stepping up their product design game with their modern-looking clippers. Wahl was established in 1919, which was also when they released their very first hair clippers. Since then, they’ve produced many more models of clippers. One of them is the 8500 Senior, a modestly-priced pair of clippers. Don’t let the price fool you, though — customers claim that they feel very professional and well-made. This is the cheapest product in my selection. Visit this link to check the exact price. This clipper doesn’t require you to swap blades like crazy. It has a nifty little lever on the side that lets you change lengths with one hand — very useful for quick fades and tapers. The reviewers (on top of the product itself, of course) love Wahl’s amazing customer support. Seems like the most common complaint in the online reviews is definitely the fact that they get quite hot after a few minutes. Sounds too good to be true? Check the reviews yourself! Blades have two annoying characteristics. They get hot after a heavy use and they eventually get dull. Andis’ attempt at solving these problems is by using ceramic. Ceramic blades — just like kitchen knives — don’t get dull as quickly as steel. They also transmit a lot less heat, making them cooler. This makes these clippers ideal for heavy-duty use in barber shops and large families. Just as with the 5-Speed, you’re able to convert these clippers into cordless by purchasing a special battery pack. But beware! Some customers say that these clippers started dying in the middle of a haircut when running off of batteries. You’ll also need to get used to a different balance of the tool when using the battery. Click here to see more high-def photos of Andis Ceramic BGRC. In the box, you get two sharp ceramic blades (#000 and #1) that reportedly cut very well on this clippers. They are very heavy-duty and extremely quiet. 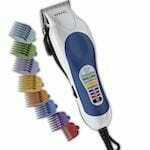 Click here to see if you can get free shipping with these clippers. Don’t want to spend hundreds of dollars? Looking for something that doesn’t quite belong in a barber’s toolbox, but will last you a few years? Look no further. We’ll now look at the products that didn’t quite make the cut to be included in the “best clippers” category, but are still pretty good for home use. Tired of cleaning up after you’re done cutting hair? This Remington is the new kid on the block, and it makes a perfect solution to home haircutting. Because of the built-in vacuum cleaner your floor and counters will stay perfectly clean. Along with the clippers, you’ll also receive a bunch of helpful accessories, like scissors, combs, and guards. While it doesn’t compete with the top choices, it can be great for the occasional home use. It can cut beards as well, but won’t vacuum up the stubble as well as hair. our top home pick. We love it! Click here to see if this clippers are still in stock. These are “the beast”. At least that’s what reviews say! They were made for all kinds of cutting, tapering, fading, and can even be used as beard trimmers. Being made of metal, these hair clippers are also very sturdy. People report of surprising quietness of the tool, I quote: “you can hear every single hair getting cut”. Like Wahl Senior I mentioned above, these clippers also have a special lever on the side allowing you to cut hair without much hassle. These get quite hot after a while, especially because of their metal casing. So if you’re a very busy barber or take a long time to create a haircut these might not be the best. People love these and the 8500 Seniors for home use. Many of the reviews point out that they use them for cutting their own or their family members’ hair. Click here to view close-up photos of the metallic finish. Note: There is a possibility of the tool making a rattle sound – this is not normal and should be fixed by just slightly tightening the screw on the side. Don’t forget to oil these top hair clippers regularly. Fast Feed is perfect if you want an Oster but are not ready to invest a lot of money. The clippers have very plain design, but they offer everything a DIY hairdresser needs; power, brand, and quality. Along with the tool, you’ll also get 4 combs, and the standard accessories. The clippers feature a lever that controls the blade. It might be a good idea to get an additional set of guards along with the clippers. Unfortunately, the low price comes, well, with a price. These clippers are far from the build quality of their more expensive counterparts. Some customers report of the blade lever eventually breaking and clippers missing hairs as well as the tool getting hot after pretty short time of usage. Click here to see more close-up pictures of Oster Fast Feed. Cords can be pretty annoying to fumble with when cutting hair. Sterling Eclipse avoids most of these issues with the great-quality battery and power. The clippers hold power for a long time, but don’t expect the battery to last decades. The design of these clippers is plain and simple, narrow enough to fit nicely in your hand. Due to its non-standard design, however, you won’t be able to use other Wahl’s blades. Click here to see more high-resolution photos of these cordless clippers. Don’t hope to cut your hair very short with these either – just like many home-use clippers, the closest to your head as you’ll get is ⅛ inch. Other than that, they’re pretty quiet, and they make a nice travelling or at-home set. 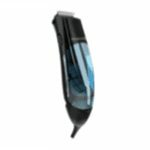 In the category of dirt cheap home use hair clippers Color Pro probably wins the trophy of the most loved family product. The clippers cost almost the same as a single haircut, so they pay for themselves in a single session. The product is supposed to cut the hair of everyone in your family. In the box, you’ll find color-coded combs that will let you easily memorize everyone’s favourite hair length. Wahl has also added a booklet with instructions on different haircuts. Click here to start saving money on haircuts with these family clippers. While these clippers feel heavy enough in your hands and are pretty well-built, the blades are unreliable and tend to miss a few hairs here and there or even pull hair. If you’d prefer a more metal look, consider the very similar model Wahl Chrome Pro. Click here to see if the price is still low. If you’re able to get Super Taper on a sale somewhere, get it! This clipper is a fabulous find, just somewhere between home use and professional. Customers say that the set is very durable, cuts well, and is great for fading. Some isolated reviewers report that these clippers quickly get jammed with hair due to errors in assembly. They also vibrate a lot. Click here to read the rest of user reviews. In the box, you’ll get 8 plastic guard and a comb. Keep in mind that while the clippers look metal, they actually aren’t — they’re made of plastic, but the paint may make them look metallic. Click here to see if the price of Super Taper has gone down. A good set of hair clippers can be expensive. Here’s a few tips on how you make sure they will last a long time. You should wipe the casing of your clippers after every use. And you should probably brush the guards every once a while to remove the dirt. But how on earth do you clean the blades? Well, it’s not that hard, really. Simply take a small brush (sometimes, it will be supplied with the clippers) and drag along the blades. 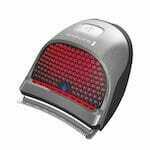 Turn the clippers on and off again to release any hairs wedged between the blades and brush one more time. For more information on properly cleaning your clippers, consult the user manual that came with your clippers. Your blades will become dull and will not cut as well anymore. Or you will accidentally drop and break the blades. These things happen. Fortunately, blades are easily changed — at least with the professional-grade clippers. For the instructions on how to do it, look into the user manual. If you lost yours, I suggest you search for it online. With some luck, you’ll come up with a pdf you can consult. We have a thorough guide to sharpening hair clipper blades right here. Every few haircuts, you should oil your clippers to keep them running smoothly. You should get a tiny bottle of oil with your clippers, but you can always order a new supply. To oil your clippers, simply dab a few drops of the oil between the blades and run the clippers for a few seconds to let the oil spread. That’s it!